Do you love the aroma of hamburgers and hot dogs sizzling on the grill during a warm summer day? If the answer is yes, then you’ve come to the right place. My family loves to use our grill for parties and quick and delicious dinners, and as grilling season rolls around, now is the time to make preparations. Whether you’re looking to upgrade your grill, get a grill for the first time, or test out a grill different than the one you have, read this guide to give you the knowledge you need to reach grill nirvana. What about the grilling surface? When you go shopping for grills, it’s easy to get confused by the glamour of shiny new metal and bright colors. Good thing there are only four main types of grills: gas, charcoal, electric, and portable. Each type has a different potential for flavor, a different price point, and requires different resources to get the fires going, so to speak. The rest of this guide will go through them one by one so that you can determine which is best for your budget and needs. Gas grills are the most widely used backyard grill. They are powered by either natural gas or bottled propane. Some grill enthusiasts may favor one over the other, but there is no flavor difference between using methane or propane to char your burgers. The real differences are price and convenience. It is less expensive and easier to use a natural gas line than to keep your propane tanks topped up. While most gas grills were made for bottled propane, they can easily be adjusted to use natural gas. If you want to know more about that process, check out the video below. The best thing about gas grills is that they’re quick and easy. Very little preparation is needed, and there’s no charcoal to clean up after you’re done the cooking. 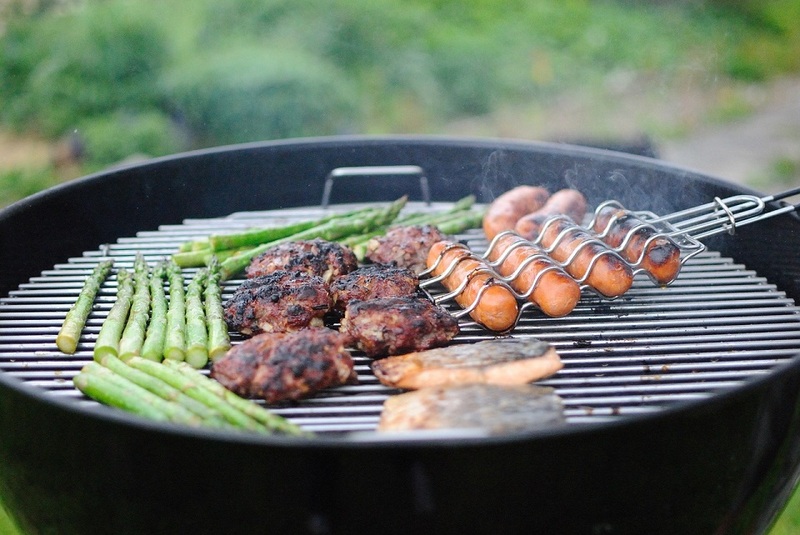 Gas grills are great for quick grilled dinners, casual weekend parties, and brunches. The disadvantages of gas grills include loss in flavor and high price. Even though it’s possible to get a small smoker box with your gas grill, it won’t impart nearly as much smoked flavor as a true smoker or charcoal grill. Also, gas grills will always be more expensive than their charcoal counterparts of similar quality. With lower-priced gas grills, you can expect one to two burners encased in an aluminum body. The Char-Broil Quickset is one such example, costing around $100 and great for quick meals. You can even leave it outside without worry because coated aluminum doesn’t rust easily. As of price and quality increases, you will find stainless steel bodies, three to five burners, and side burners. 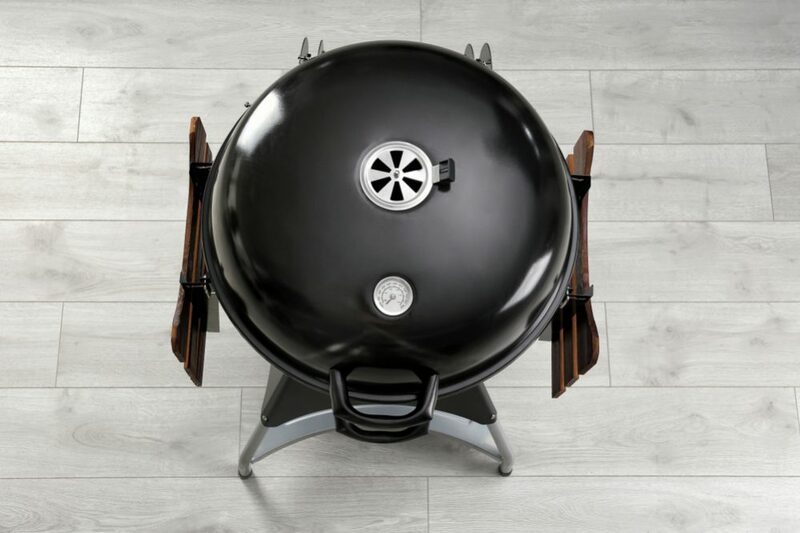 Two excellent higher-end options to look into are the Weber Summit S-420 or the Weber Genesis S-330. Grilling surface materials for gas grills can consist of iron grates, stainless steel sheets or bars, or porcelain-covered steel bars. Out of those options, stainless steel bars offer the best performance. They are easy to clean, long lasting, and give you great grill marks. Unfortunately, they usually only come with grills that are over $500. Iron grates work well but are harder to clean, and porcelain covered steel bars are your best lower end grill option. While steel sheets look nice, they don’t cook evenly and are notoriously difficult to clean, so you should avoid those. Electric grills come in both outdoor and indoor models and use electricity to cook meat and vegetables on grill plates. Some people aren’t legally or physically able to have a charcoal or gas grill, and that is when electric grills are the perfect option. Although they won’t give you that charcoal flavor, they can still give you beautiful grill marks and help you cook your steak to perfection. 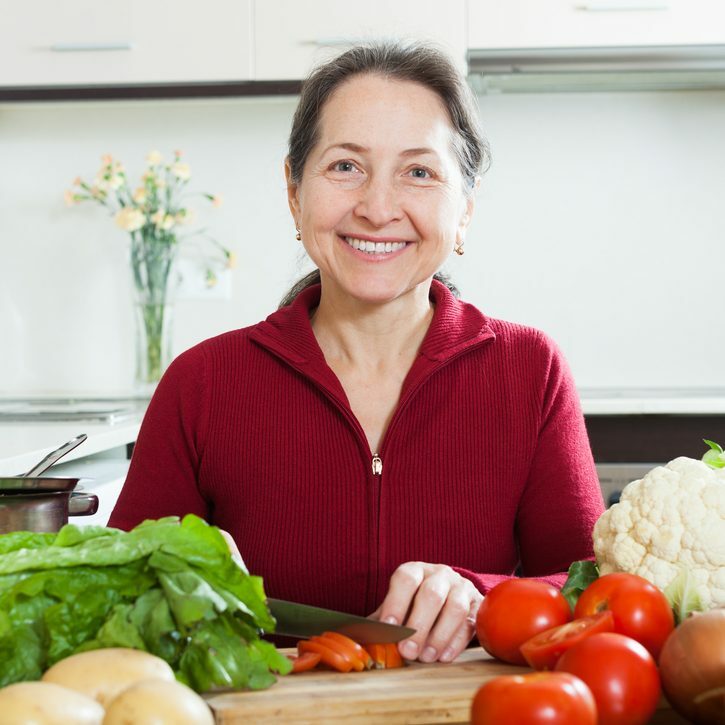 In the past, it was impossible for people living in cities that had fire regulations banning charcoal and gas grills to enjoy a home-grilled meal. With electric grills, that problem is a thing of the past. 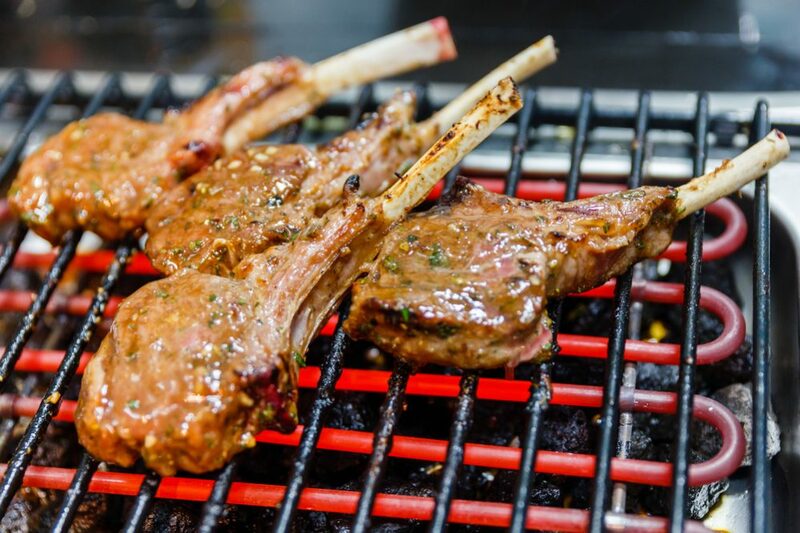 If you live in a city or at close quarters, then an electric grill can satisfy your desire to grill without angering your neighbors or breaking the law. Still, remember to check with your building and city regulations to make sure your grill is good to go before you buy it. The biggest disadvantage of an electric grill is the loss of flavor. While electric grills can create grill marks that look exactly like those of their fierier siblings, the smoky flavor that can only come with cooking on a real fire is lost. 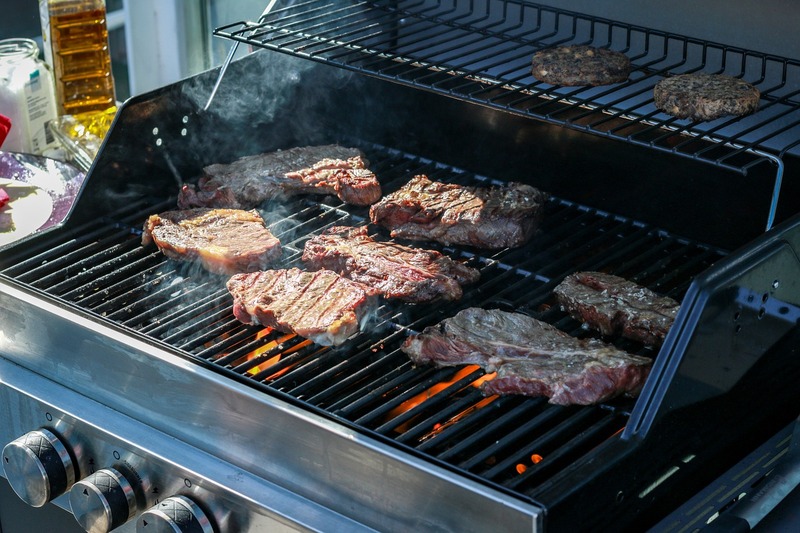 When looking at electric grills, some factors to keep in mind are pre-heat times, heat capacity, size, and ease of clean up. On the lower end of the price range, you’ll see grills that take a longer time to heat up, don’t go above 400°F, and can’t fit more than four burgers at a time. As you go higher in price and quality, you will find electric grills with larger surfaces that can go up to 700°F in less than five minutes. One of the biggest issues with electric grills before the incorporation of infrared technology into electric grilling was the inability to produce higher temperatures. While most electric grills still use the conventional cooking by conduction (transfer of heat between surfaces) and convection (transfer of heat through hot air or water), now you have another option as well: the infrared electric grill. Infrared grills heat up faster and produce higher temperatures than traditional electric grills. This allows for the sear that once eluded electric grill users. To learn more about infrared grills, you can watch the video below. 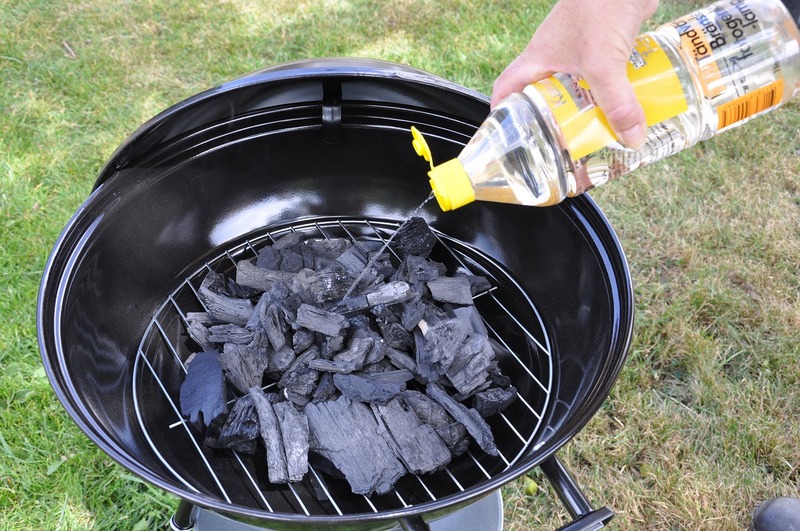 Charcoal grills use charcoal briquettes for fuel and provide a more expensive and time-consuming cooking experience. Despite this, many people prefer the taste of charcoal grills over all other and are willing to invest the extra time and money needed to achieve the delicious, smoky holy grail of grilled flavor. If you are looking for perfectly seared, juicy meat with an authentic smoked flavor, then this type of grill may be the one for you. The biggest advantage of charcoal grills is flavor. Burning charcoal creates hotter temperatures than burning gas. This lets you easily create the delicious sear that is associated with grilled meat. Using natural wood charcoal also allows for a variety of adjustable and authentic smoky flavors that would otherwise elude you. Time and money. Unlike with a gas or electric grill, you can’t just flip a switch and expect the grill to heat up in a matter of minutes. A charcoal grill takes up to an hour of hands-on preparation before it is ready for cooking. You also need to clean out the ashes afterward in addition to cleaning the cooking surface. Charcoal is also more expensive than gas. There are a variety of charcoal grills on the market. Round kettle grills can give you a delicious smoky flavor and are most suitable for short cooking times while barrel grills are great for recipes that require cooking at lower temperatures for longer, such as 12-hour briskets. A helpful feature that some barrel grills have that kettle grills do not is a charcoal tray that is height-adjustable to control heat. Just as with gas grills, stainless steel bars are the best grilling surface. Unfortunately, they are hard to find on charcoal grill models. Other good options are porcelain coated steel or plated steel bars. Iron bars work well, too. Just keep in mind that you will need to remove, clean, and re-oil iron bars after each use. This is a subset of propane and charcoal grills, but it is worth mentioning for the picnic, tailgating, or camping enthusiasts. Portable grills are exactly what their name implies. They are lighter than their full-sized counterparts and easy to transport. Size. You won’t be able to feed a party with 40 people, but you will be able to grill for your family at an outdoor picnic. Portable grills are ideal for grilling on the go. The sacrifice you make is that the small size limits the amount of food you can cook at one time. There is a wide range of portable grill styles available. If you’re looking for a good portable propane grill, then you can look into the Weber 1520 Propane Gas Go-Anywhere Grill. The main factors you want to consider when comparing grills is size and durability. You want a grill that is able to withstand the hardships of travel and also one that is large enough to cook for the number of people you expect. By identifying what your grilling goals are, you can pick the grill that fits into your budget and lifestyle. Whether you decide to go with the Char-Broil Quickset, Weber Summit S-420, Weber Genesis S-330, Weber 1520 Propane Gas Go-Anywhere Grill or one of the many other types of grills out there, remember that the most important aspect of summer grilling is having fun with friends and family. Comment below with any thoughts or questions, and go on and take the leap into the best grilling experience you’ve ever had!